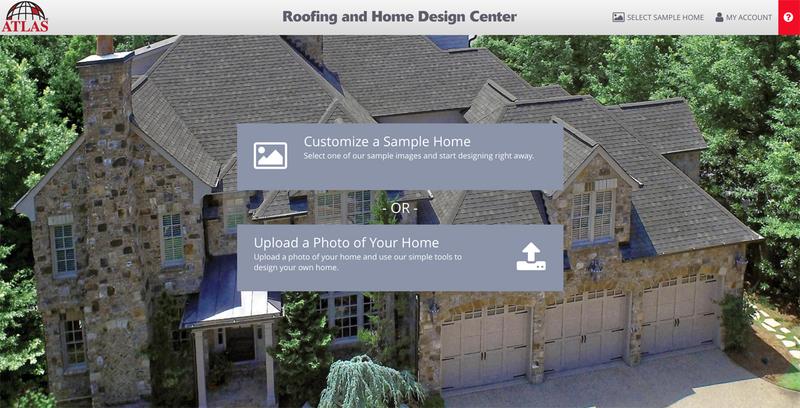 Atlas Roofing is pleased to announce the launch of its Roof and Home Design Studio, an easy-to-use design tool that homeowners and contractors can access to choose shingles and create a whole new look for the home. With just a few clicks or swipes, homeowners can customize the look of their home with Roof & Home Design Studio. Contractors can use the tools to show their customers a variety of shingle options and help them make decisions about a new roof. With the Roof & Home Design Studio tool, homeowners can customize the look of their whole house, from top to bottom. They can select shingles; masonry, brick or other siding; trim; and even shutters. Users can access a vast array of styles and colors for every option. To see what their choices look like, they can choose a home from the online gallery or upload a photo of their home. Once users make their choices, they can save, download and share them. Roof & Home Design Studio is available for computer, tablet and mobile phones. Begin your visit to the Design Studio at AtlasRoofing.com/Roof-Inspiration, scroll down to Start Your Design. In addition to the Roof & Home Design Studio, Atlas offers a simple visual selector on its shingles webpages. The Atlas Visual Product Selector is the page where users can see all of the details about the shingles they are considering. Users can choose their shingles by style (slate, architectural or 3-tab) or features (warranties, impact resistance, wind protection or Scotchgard™ Protector). After making a selection, users can visit the product pages to choose colors and learn more about product features, view product videos, download literature and view warranty information. Visual Product Selector is available for computer, tablet or mobile devices. For contractors, the Roof & Home Design tool is built into the Atlas ProApp software.